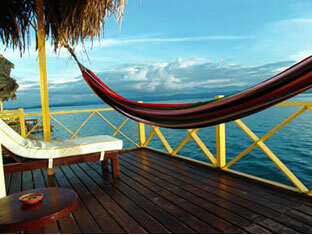 Punta Caracol was born from the concept of creating an Acqua-Lodge in a totally virgin and natural environment. The idea is to offer guests a pure and intimate experience with nature in a place of singular beauty where they can relax in comfort. Built over the Caribbean Sea along a coral reef that is a mile long, Punta Caracol was constructed using the traditional methods of the Archipelago. Each handsomely crafted cabin is built upon stilts which support a wooden frame over the water and and is covered by a palm leaf roof - an unforgettable habitat congruent with the native communities of the region. Natural building materials offered by the rich nature of the region were used, different kinds of native woods and plants, clays, leafs, bamboo, wild cane and others. The result is a warm close-to-nature ambience. 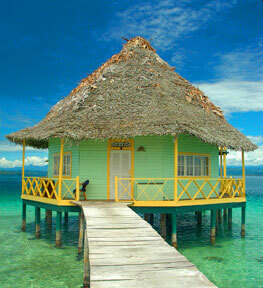 Enjoy one of five exclusive cabins set over the crystal clear waters of the Bocas del Toro archipelago. 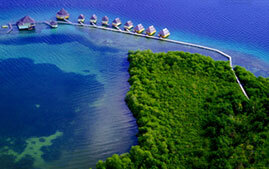 From your private terrace you will be able to observe impressive sunsets interrupted only by playful dolphins. At night, the restaurant's impressive terrace and thatched roof creates the perfect ambience for a candlelight dinner where you can enjoy a variety of Caribbean, local and international dishes. At Punta Caracol Acqua-Lodge ancient craft construction techniques are combined with the most advanced alternative energy creation systems such as solar panels, which generate power for the restaurant and all suites. 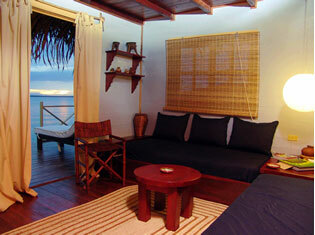 All our Suites have hot water, and 12-volt electric power supplied by the solar panels installed in its thatch roof. In order to make your stay with us more comfortable, all our Suites have complements offered to each guest upon his arrival at Punta Caracol acqua-lodge, such as mineral water bottles each night, raincoats, umbrellas, flashlights, snorkeling equipment, beach towels, reading lamps and a hygiene kit.